Total outbound tourists for the second quarter in 2016 were estimated at 104,331, an increase of 9.3 per cent over the corresponding quarter last year. 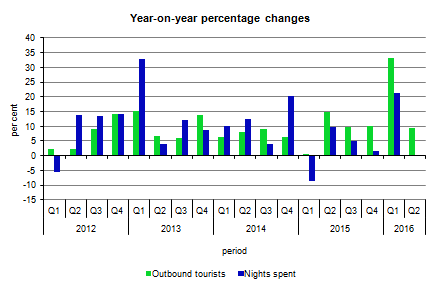 During the second quarter of 2016, the number of outbound tourist trips towards EU countries stood at 93,863, an increase of 9.0 per cent over the same quarter in 2015 (Table 1). Italy and the United Kingdom remained the most popular destinations, with a share of 54.0 per cent of total tourist trips (Table 4). Total nights spent by outbound tourists increased by 0.3 per cent, reaching 740,470 nights. In absolute terms, the majority of guest nights were spent in pri vate accommodation establishments (Table 3). Total estimated outlay by resident tourists between April and June decreased by 1.3 per cent over the same quarter of 2015, and stood at €88.1 million, equivalent to an average €845 per trip (Tables 5 and 6). Total outbound tourist trips between January and June 2016 numbered 207,795, an increase of 20.0 per cent over 2015 (Table 7). Total nights spent by outbound tourists went up by 9.2 per cent, reaching 1.4 million nights (Table 9). In addition, total estimated outlay by resident tourists stood at €180.0 million, 12.4 per cent higher than that recorded for the same period in 2015 (Table 11).